Does “Humane Meat” Bring People Closer to Veganism? Debunking the claim that “humane meat” is a positive step toward veganism, my good friend and fellow vegan, Sherry F. Colb author of Mind if I Order the Cheeseburger, posted this essay on Dorf On Law today and encouraged me to share it. I encourage you to share it as well. 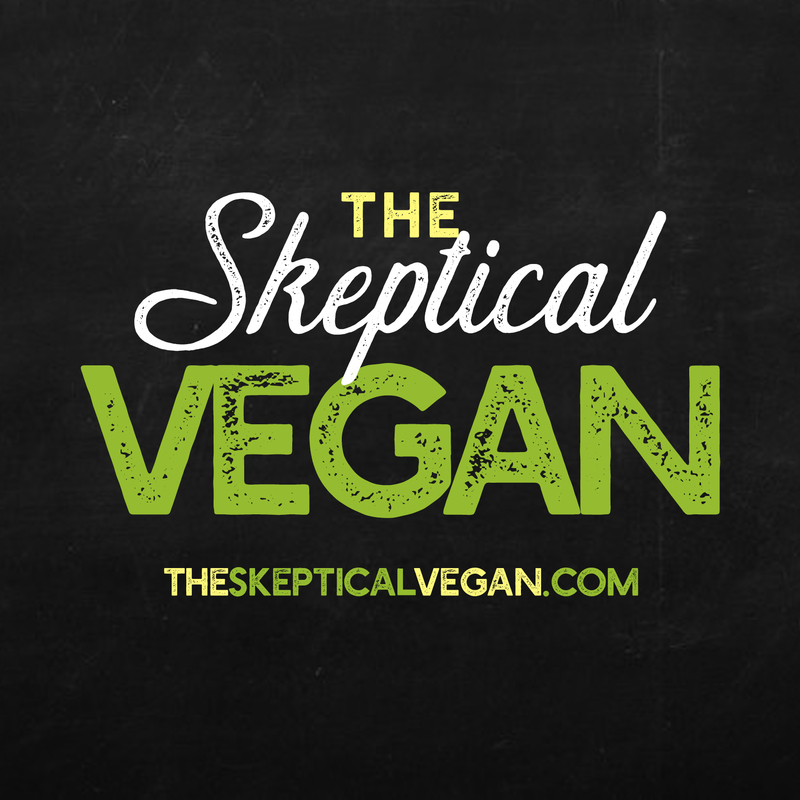 Over the last few months, I have repeatedly heard a peculiar claim articulated by a variety of vegan advocates on different vegan outlets. The claim is this: Even though it might seem that people consuming so-called “humane” animal products poses an obstacle to the movement for veganism, “research” shows that the opposite is true. “Research” shows that when people decide to purchase “humane” animal products, this choice increases the odds that those same people will eventually decide to become vegan. When I first heard this claim, I was intrigued. Could it be that animal farmers encouraging people to purchase their “local, sustainable, and [allegedly] humane” animal products were actually helping the vegan cause? The answer is that the research on which people have based this conclusion gives us no reason to imagine that “humane” animal products bring people closer to veganism. My own conclusion, based on a combination of logic, experience, and my own anecdotal observations, leads me to believe that in fact, the opposite is true, that encouraging people to consume so-called “humane” animal products poses a major obstacle to the continuing spread of veganism. But quite apart from what I think, the research that supposedly supports the utility of encouraging the consumption of “humane” animal products in moving people closer to veganism does no such thing. How can I say this? Well, let us consider what the research actually shows and why the conclusions people have drawn from that research do not at all follow from it. Here’s the supposedly revolutionary finding: It turns out that people who purchase animal products labeled “humane” (or “compassionate” or some other equally misleading adjective) may be more likely eventually to become vegetarian or vegan than are people who do not purchase these products. That is, there is a correlation between people buying animal-derived products labeled “humane” at point 1 in time, and people reducing or ending their consumption of animal-derived products at point 2 in time. As everyone knows, a correlation does not necessarily indicate causation. But the problem with drawing the inference that vegan advocates have been drawing from the above finding goes well beyond the “post hoc ergo propter hoc” fallacy. Enter “selection bias.” Selection bias is the reality that people will often self-select to engage in an activity at time 1 and whatever motivated that self-selection can also fully account for the same people’s choice to engage in another activity at time 2. Consider the following observational study. I observe that one group of people spends a lot more money at the grocery store on luxury items such as truffle oil and saffron than other people do. I decide to keep an eye on these people, because I want to know what the impact of all of this supermarket-spending might be. Eight months later, I observe that this same group of people is embarking on much more exotic and expensive vacations in places much farther away from home than other people who did not spend as much money at the supermarket as this group did. I conclude from these observations that buying expensive food at the supermarket helps enable people to be able to go on exotic and expensive vacations eight months later. Wanting to go on such a vacation myself, I immediately begin to spend a lot more money on groceries. This hypothetical example helps illustrate selection bias. The act of spending a lot of money at the supermarket did not help to make an expensive vacation possible. If anything, this act would appear to hinder one’s ability to take an expensive vacation, all things being equal, by depleting one’s bank account. However, the people who choose to spend a lot of money at the supermarket are often doing so because they have a lot of money. Their having a lot of money has caused them to feel free to spend a lot on groceries. Then, eight months later, because they started with a lot of money, more than other people have, they also had enough money to pay for an expensive vacation that the rest of the population cannot afford. If I were to take my observations as evidence that spending a lot on groceries enables one to take an expensive vacation, however, then I would probably end up undermining my own goal, and I would be doing so because I ignored selection bias. A very similar dynamic seems likely to be in play when we observe that the people who purchase “humane” animal products at Time 1 are more likely than people generally to be purchasing only vegan products at Time 2. Buying supposedly “humane” animal flesh and secretions is something that many people do when they are driven to try to act more mercifully and ethically toward their fellow sentient beings. Years ago, before I became vegan, I tried to buy containers of cows’ milk (or what would more accurately be called the “lacteal secretions produced by a mother for her baby calf”) that said “grass fed” and “organic” on them, because I thought (erroneously, as it turned out) that this meant that the cows from whom the milk was taken (a) did not encounter human violence and cruelty during their lives and/or (b) were allowed to live out their lives in peace, eating grass, never having to be slaughtered. Eventually, I learned that my beliefs were nonsense (nonsense amply cultivated by those who sell animal products), and I made the decision to become vegan. It is hardly the case, however, that consuming (mis)-labeled animal products helped move me closer to veganism; if anything, it slowed me down by falsely assuring me that I was already “doing right by the animals” by avoiding “factory-farmed” products. If you think about it, it is not at all surprising that people who feel moved to act ethically and mercifully toward animals will make up a disproportionate share of the people buying supposedly “ethical” animal products and a disproportionate share of the people becoming vegan. A third variable — consciousness about one’s obligation to refrain from inflicting unnecessary suffering on other beings — can fully account for people’s desire to do both things. Similarly, if you observe someone buying a vegan frozen pizza, such as Tofurky, at Time 1, you may be more likely than otherwise to observe that same person adopting a dog from a shelter (rather than purchasing a dog from a breeder) at Time 2. Yet no one would claim that eating a slice vegan pizza causes a person to adopt a dog from a shelter. Ordinarily, it might seem harmless when people assume that performing act 1 causes a person to perform act 2, just because we observe that the same people who perform act 1 later perform act 2. But if the goal of citing this research about “humane” animal products is to alter the way that people conduct their advocacy, then it is anything but harmless. If someone tells me that he buys all of his flesh from a “humane” butcher and all of his lacteal secretions from a “humane” dairy farmer, this tells me that he is the sort of person who cares about animal suffering and wants to do what he can to reduce it. He has, however, been misled into thinking that what he is purchasing is the product of merciful treatment towards animals, when it in fact involves tremendous cruelty and harm to animals, and he is also (from a logical standpoint) less likely to become vegan than he was before, because he has managed to mollify his conscience by purchasing the “humane” product. Indeed, that is presumably why suppliers create the “humane” product in the first place — to keep animal consumers consuming animal products and to distract them from the actual humane alternative, vegan products. The purveyors of “humane” products could hardly be expected to label their products “humane” if they believed that such labeling would lead people closer to veganism. I know that there are many people who are far more interested in the phenomenon of selection bias than I am and who have much more to say on the subject. I have nonetheless decided to write this post about selection bias, because I have felt an increasing amount of frustration upon hearing this claim about the counter-intuitive results of “research” that should be altering the way animal advocates engage with the public. The research may tell us that the people who consume humane animal products are, all things being equal, more likely to become vegan than the general population. But this plainly does not mean that consuming “humane” animal products moves people closer to veganism. And if you are hoping to take an expensive, exotic vacation, I would strongly recommend against spending large amounts of cash at the supermarket between now and your vacation time. You’re welcome. PAINTINGS: “Human Evolution 1 and 2” by Al Jackson. I got in trouble tonight. Jen told me I was eating too much “processed foods” (whatever that means) and not enough whole foods and vegetables. All of my vegan pizzas and vegan Buffalo wings and vegan soy chorizo tacos are nearly as bad for me as meat (according to Jen … I said that last line in a whiny voice). So, tonight, I decided to go down in a blaze of glory: Gluten-free, vegan Beef Stroganoff. Boom. Epic. I always liked beef stroganoff. What’s not to like? Beef on noodles swimming in gravy with sour cream stirred in. Sounds like heaven to me. So when Beyond Meat introduced their Beyond Beef product, I was game to try and recreate this hearty Russian fare. Really, the ingredients are pretty basic but to be able to make this gluten-free and vegan took some doing (especially since it is traditionally served over egg noodles). I started with thin sliced onions, a variety of mushrooms, some parsley, vegetable stock, pepper, and gluten-free rice flour to create the gravy. After the gravy was bubbling, I added the Beyond Beef and stirred. It immediately took on the personality of a traditional beef stroganoff but SO much better for me (yeah, right). Once the beef was hot, I stirred in my favorite Tofutti sour cream and poured the delectable concoction over my gluten free tagliatelle noodles (these look and taste very much like egg noodles). Jen and I stared longingly at each over across the stroganoff and she reiterated the importance of adding more greens to my diet. To which I responded by eating the parsley garnish. Do you own, or know someone who owns, a vegan company? Point them to ThankTank Creative! Vegan Journey: Meet Eric L.
I’ve said it before and I’ll say it again, I eat more, and more often, as someone who is on a “limiting diet” than I ever did as an omnivore. And no one has to die for my meals. When I first went vegan I was the first to complain that there was nothing to eat. Other vegans would disagree and I’d offer up irrefutable evidence exhibited in a vending machine. I now know what an idiot I looked like. Today I am planning, preparing, plating and pounding out more amazing vegan dishes than ever before. 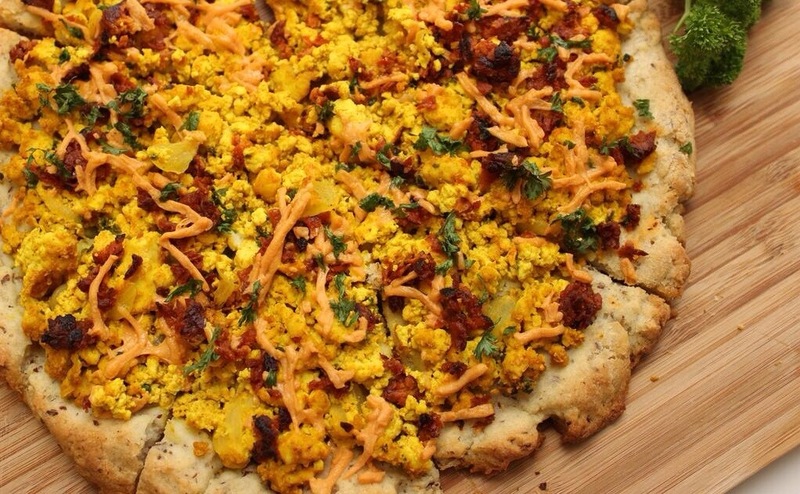 Like this home made gluten-free, vegan breakfast pizza (breakfast pizza, of course, used to be a mainstay of my diet since I could grab two slices at the local gas station). Yes, I used to eat at gas stations. By the way, you are more than welcome to drool over your keyboard. Go Vegan and Don’t Go Hungry. The following blog post was originally published on EatDrinkPolitics.com and reposted at MeatyVegan.com with permission by its author, Michele Simon. For more information, visit EatDrinkPolitics.com. My new report, Whitewashed: How Industry and Government Promote Dairy Junk Foods, shines a light on the shifting patterns of consumption away from plain milk toward dairy products laden with sugar, fat, and salt. Checkoff money is also only supposed to be used for “generic” marketing activities. However, the program gives a huge boost to leading fast food chains. Speaking of schools, the dairy industry, with a government assist, is heavily promoting chocolate and other sugar milks to schoolchildren, desperate to maintain its presence in a lucrative market with a captive audience. Finally, many federal checkoff-funded dairy organizations make dubious health claims to market their dressed up junk foods. “Chocolate milk is the perfect balance of vitamins, minerals, carbohydrates and protein—a combination that can’t be found in any other beverage”. This entry was posted in Big Food, Child Nutrition, Food Policy, Industry Tactics, Marketing to Children, Public Health and tagged: child nutrition, childhood obesity, dairy, deceptive health claims, junk food, school food policy, USDA. | Michele on Google+ | You can follow any responses to this entry through the RSS 2.0 feed. You can leave a response, or trackback from your own site. Just outside of Chicago there is a company that ships meats around the world. Everything from “chicken” to “beef” to “pork,” “jerky,” and even “eggs.” However, this “meat market” is decidedly different than any of the others in the Midwest. All the meat they ship is, well, fake. FakeMeats.com, a family-owned and operated business, is every Meaty Vegan’s dream come true. Delicious, different, decadent, and innovative vegan meat substitutes that make making any meal meaty. When I first met co-owner Steven, the connection was immediate. He and his wife, Kim, are the two nicest and accommodating people you would ever know and are passionate about their products. Just browse their amazing website … I’ll wait. See? Pretty much everything you would ever need to make any omnivore convert! I am in love with all of their products but a few stand out as my favorites. One of these favorites is the Butler Soy Curls. I first had these at a Super Bowl Party where they became fried crunchy Buffalo bites. After that, I always make sure to have a bag on hand. They are perfect in chicken cheesy burritos and as a topping on a Buffalo pizza. What I really love about these soy curls (besides the incredible price), is that they are shelf-stable. As a sailor, I am always looking for dried foods that are versatile and delicious and these soy curls fit the bill. To re-hydrate these, simple soak in warm water for ten minutes and drain. They immediately become “shredded meat” that can be used in almost any recipe. Once my soy curls are reanimated, I season them with my favorite Arizona Gunslinger Jalapeno Pepper Sauce, GF/V BBQ sauce, a touch of salt and a dash of cinnamon. The soy curls take on a delicious flavor and color and one cup of dry soy curls is enough to make four crunchy cheesy burritos. I warm my brown rice tortilla (Food for Life), with a neatly centered slice of VioLife cheddar cheese and microwave for exactly 35 seconds. The tortilla becomes very pliable and while it’s still warm, I add the seasoned soy curls, some avocado, a little salsa and fresh cilantro and fold and roll. I lay the burrito seam-side down on a pre-heated non-stick pan and cook for two minutes on medium heat (don’t turn it over yet … be patient). After two minutes, flip it over. See? Aren’t you glad you waited? Cook on top side for 2-3 minutes more. Slice diagonally to reveal all the goodness that is contained within. Seriously, look at all that goodness! The same recipe can be created using the Dixie Diner’s Club’s Beef (Not). Another wonderful dehydrated soy product that is the perfect starting point for ground beef or, more importantly, soy chorizo. This product is also available in other variations and I would recommend buying one bag of each and experimenting. Not sure what to buy? Subscribe to any of their meat-of-the-month plans and let them send you samples of their best new products. Meal packs … jerky of the month … snack packs … FakeMeats.com makes it simple to enjoy meat again … without harming a single animal. Find them online, on Facebook and on Twitter. STAY TUNED for more FakeMeats.com reviews including a New York City cupcake spectacular using this amazing product from Vegg. Going from 100% omni to 100%vegan overnight meant I had to relearn everything I knew about cooking. No longer could I rely on a hunk of meat to anchor the plate and surround it by sides and sauces. Cooking vegan takes a higher skill level, a level of finesse, and, in the end, is far more rewarding in so many delicious ways. With over two years experience under my now smaller belt, my ability in the kitchen pales in comparison to one of the Internet’s most popular vegan instructors and chefs: Cobi Kim. Currently (for a few more day, actually) residing in Hawaii, Cobi draws from her own background to create colorful dishes that make any foodie’s mouth water. Cobi took time out of her very busy schedule to answer a few questions with the Meaty Vegan. MV: You seem to travel extensively, what is your favorite vegan destination and your favorite vegan restaurant? CK: I’ve been spending a lot of time in Los Angeles again and even though there a zillion plant-based dining options, I seem to always find my way back to Crossroads on Melrose. I go for the Kite Hill cheese plate and vegan crab cakes, then drink my dessert in the form of their signature adult beverage, the Deliberate Accident. MV: What would you make for Sunday Brunch if the President were coming over? CK: Depends which President! But I think a Tofu Benedict Florentine, Apple Sage Sausage + Potato Hash and Fresh Berry Chia Pudding Parfait would be fare fit for the POTUS. MV: You are the producer, writer, director and host of the successful “Veggietorials” channel on YouTube, how do you find time to do anything else? CK: Little known secret: Winston the Pug, my canine companion, does all of the pre and post production work. I just show up as the talent. It’s a pretty sweet gig. MV: I have never been to Hawaii because I am fearful if I went, I would never want to leave. Is this an accurate assessment of the 50th State? MV: If you could travel back or forward in time, where would you go and why? CK: I’d like to have a peek at what the world will be like in the next 15-20 years. What other advances in technology will become essential to raise the creative collective consciousness? I want to know! MV: I’m a huge fan of Korean food and have created gluten-free, vegan versions of kimchi, soon dubu jigae, and pangeon, do you agree that every food in the world should be vegan? CK: Hmmm, do you mean every culture’s food should veganizeable or actually every type of food that is consumable should be veganized? Because the thought of vegan offal like, oh say, sweet breads or tripe is just too weird for me. I saw a can of vegan haggis once and just thought … WHY? But then again, I do have a recipe for vegan SPAM on my channel. CK: I’ve been obsessed with this cold soba noodle recipe inspired by my friend Donald. The noodles are tossed with a spicy chili-garlic sauce. Totally refreshing for summer with fresh spinach, edamame, pickled carrots + daikon and topped with black sesame seeds. MV: What’s next for Cobi Kim? CK: I’ll be taking on the adventure of moving to the PNW this summer as I work on my cookbook (release date Jan 2015). I’m so excited for the change of scenery and new sources of daily inspiration. There will be more daily vlogs on my YouTube channel along with a brand new vegan cooking series in the Fall. Stay tubed! Follow Cobi on Twitter and Facebook and subscribe to her YouTube channel for amazing videos like this one featuring Shiitake Lettuce Wraps. SO good!